It's unbelievable to think that, just a couple of decades ago, Yellow-legged Gull (Larus michahellis) was, for many, an irrelevant yellow-legged 'form' of our familiar Herring Gull encountered only while on holiday in the Mediterranean. Following its elevation to full specific status and the popularity of gull-watching dramatically increasing throughout the 2000s, the prominence of Yellow-legged Gull as a British bird has risen greatly to where it is today. 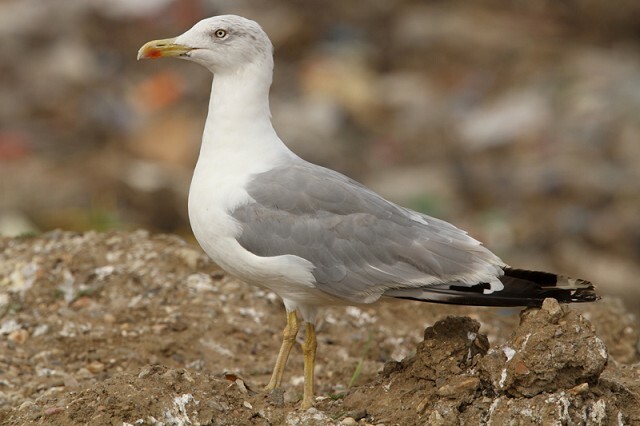 Yellow-legged Gull is a regular non-breeding visitor across the bulk of England, with notable exceptions being the far north and northwest — Yorkshire is about as far north as the species is regularly seen, and it is particularly rare on the west coast north of Cheshire. It is rather scarce and localised in its appearance in Wales, while it remains a genuinely rare species in Scotland. Its strongholds in England are across the Midlands, East Anglia and the South-East, where it may appear in considerable numbers at the right times of year. It is, however, always localised — generally numbers only turn up at sites where other large white-headed gulls congregate (such as refuse tips, roosts at reservoirs and so on). The species has often been thought of as a target for winter gull watchers but, in reality, the colder months are not the best time to search for Yellow-legged Gulls in Britain. In fact it is about now (mid-July) that numbers are climbing towards their annual peak — each summer witnesses significant post-breeding dispersal as birds move north from their breeding colonies around south and central Europe. Birds begin to arrive in Britain in numbers from late June onwards; non-breeding immatures are generally the first to arrive, followed by adults and juveniles as July progresses. Numbers steadily build throughout the summer, peaking in August and remaining high through September before dropping off again into the autumn. With numbers on the increase throughout July, this is a great time of year is to be out looking for Yellow-legged Gulls and, in particular, the first juveniles as they arrive from the Continent. At this time of year, some older plumages are dissimilar (at times unrecognisably so!) to the winter age-classes that many birders will be familiar with, and varying degrees of moult and wear all contribute to the ID challenge. However, juveniles will be in crisp, fresh plumage and their rangy structure gives them a certain elegance, making them an attractive find for any birder inclined to sift through a flock of gulls from early July onwards. The first juveniles tend to appear in the first week of July (though there are occasional records from the very end of June), with numbers greatly increasing during the second half of the month. Identification can sometimes be tricky, but there are a number of features to look out for — not least freshness of plumage. Though we are now at the time of year that locally bred Herring and Lesser Black-backed Gulls begin to fledge, it is usually noticeable that these birds look younger than juvenile Yellow-legged Gulls (which fledge up to several weeks earlier than their more northerly counterparts). Plumage tends to betray that they've just left the nest, being in pristine condition and primaries often not fully grown. Young michahellis, on the other hand, will be looking somewhat more mature by now and the onset of scapular moult is generally noticeable in youngsters by the second half of the month. Tail pattern is one of the more obvious features to look out for in flight. A neat, well-defined yet thin black tail band (finely edged with white at the very tip when fresh), generally tapering towards the outer tail feathers to give a wedge-shaped impression, contrasts with the striking white tail and sparsely marked rump. While this can be quite clean in Lesser Black-backed Gull in particular, the black band is generally considerably broader with greater dark spotting creating a less clean impression — this even more apparent in Herring Gull. In contrast to Herring Gull, the inner primaries of Yellow-legged Gull tend to only show weak pale inner webs (this is generally not apparent at all in Lesser Black-backed Gull) and the greater coverts often appear quite uniformly dark, especially the outers — in Herring Gull the greater coverts are generally well marked and fairly extensively 'chequered' paler. Juvenile Yellow-legged Gull, Rainham, London, 6 August 2013. The clean white uppertail and rump contrast with the neat, black tailband which tapers towards the outer tail feathers. (Photo: Josh Jones). 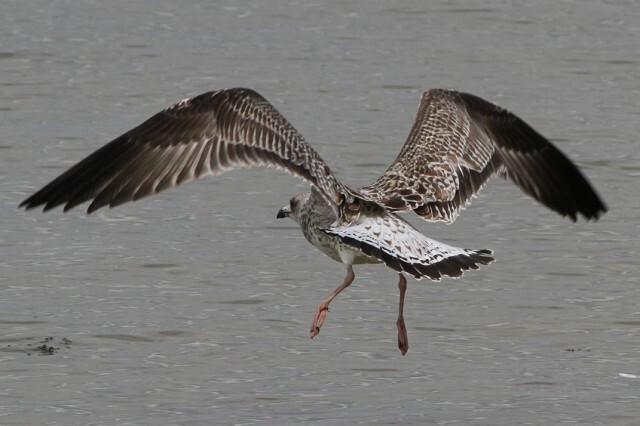 Juvenile Yellow-legged Gull, Rotherhithe, London, July 2014 (Photo: Rich Bonser). Juvenile Yellow-legged Gulls are also distinct when at rest. The dark-centred juvenile scapulars generally show only weak, almost white pale fringes, while the pale fringing on Herring and Lesser Black-backed Gulls averages more extensive and somewhat more buff in coloration, particularly in the former, though this is no doubt also attributable to state of wear. 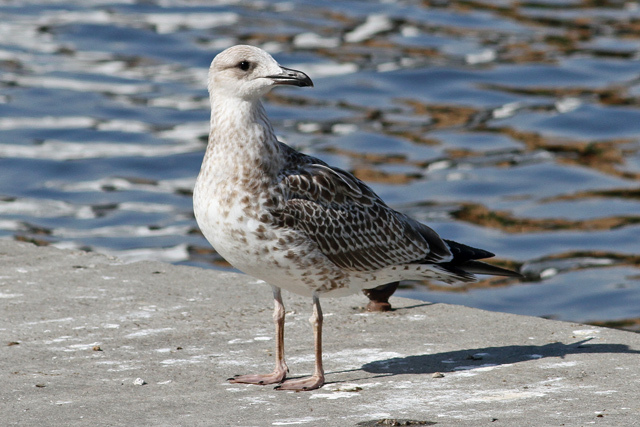 The overall coloration of michahellis is usually a warmer brown than the cold, dark greyish-brown of juvenile Lesser Black-backed Gull. The underparts are often paler than either of those species, with the belly sometimes almost white — particularly later in the month — and the dark mask around the eye contrasting with a paler rest of head, neck and body. Tertials are dark-centred with variable (but always minor) pale fringing. 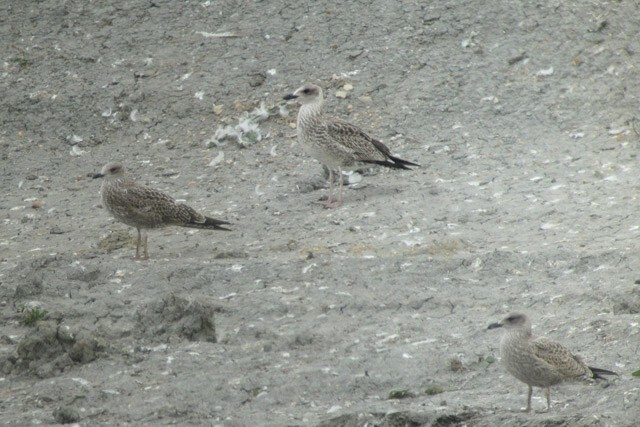 Juvenile Lesser Black-backed Gull (left), Yellow-legged Gull (centre) and Herring Gull (right), Cambridgeshire, July 2012 (Photo: Josh Jones). Many juvenile Yellow-legged Gulls are large and rangy birds, with long legs, long wings and — particularly in males — an imposing size and structure that makes them almost reminiscent of Great Black-backed Gull in these respects (and juveniles of that species have been misidentified as Yellow-legged Gulls on numerous occasions in the past). However, some — presumably females — are altogether more petite and demure, recalling some Lesser Black-backed Gulls. Care must be taken to identify them correctly, although a combination of the above plumage features should make almost all identifiable with good views. 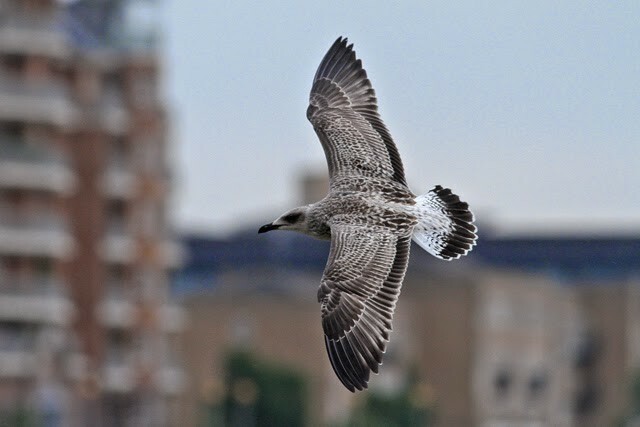 Juvenile Yellow-legged Gull, Rotherhithe, London, July 2014. Note how white the underparts already appear at this early date (Photo: Richard Bonser). 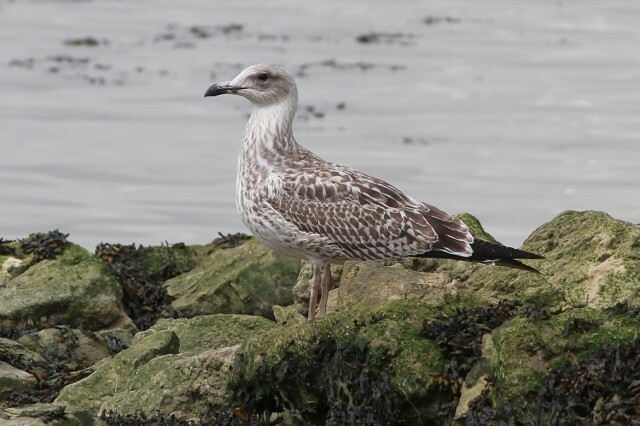 As alluded to already, the earlier fledging date of Yellow-legged Gull means that the species' moult cycle is generally more advanced than Herring and Lesser Black-backed Gull. 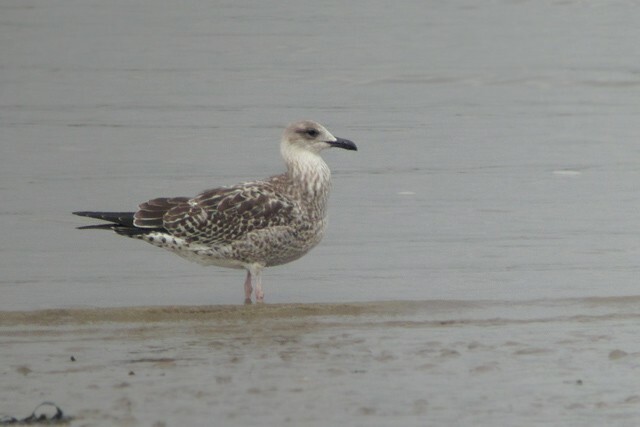 A good proportion of Yellow-legged Gulls will already be starting to show signs of scapular moult by the second half of the month, although note that this is not impossible to find in early-fledging Herring/Lesser Black-backed by the end of July and, equally, some Yellow-legged Gulls may retain full juvenile plumage into August. Generally, though, if a juvenile gull showing some/all of the above features while appearing more mature as a whole than juvenile Herring or Lesser Black-backed Gulls, there is a good chance it will prove to be a Yellow-legged Gull. It's probably fair to say that the British stronghold for Yellow-legged Gulls is the Thames Estuary, where the species is more or less resident. After numbers dip to an annual low during the spring, birds begin to arrive from June onwards and build towards a peak in late summer, when single-site counts in August have included 169 in the Rainham area. Sites such as Rainham, Crayford Marshes and Crossness are particularly good for concentrations of the species, though any flocks of of gulls along the foreshore are worth scrutinising and often give decent views, dependent on the tide. 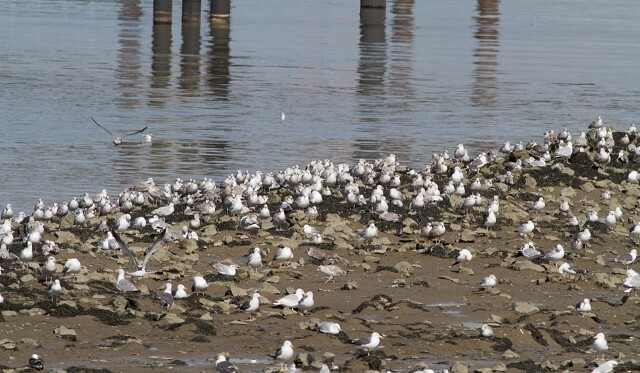 The west London reservoirs also host excellent numbers of roosting Yellow-legged Gulls during late summer and early autumn, and it is possible that the total London population may well be several hundreds of birds at this peak time of year. Sites such as Farmoor Reservoir (Oxon) and Grafham Water and Paxton Pits (Cambs) are also excellent bets for good numbers of Yellow-legged Gulls, with 50+ seen at each in most summers. The expansive pig farms of the Brecklands also hold good numbers at this fruitful time of year, and a visit to the roost at Livermere Lake (Suffolk) would no doubt yield good numbers. Also in Suffolk, coastal sites such as the Blyth Estuary and Minsmere have traditionally held birds, while further south in Kent, the Dungeness area is generally productive for sightings (and often produces the first juveniles of the year). Along the south coast, Portland Bill (Dorset) is another good location for picking up dispersing birds, while Poole Harbour (Dorset), a known breeding site for the species, is also a good bet. Further east, Cuckmere Haven (E Sussex) also tends to pick up birds. Yellow-legged Gulls can be found among any concentration of large white-headed gulls across England as the summer advances, though they do appear to become rapidly scarcer north of a line between the Humber and Mersey estuaries, and are regarded as scarce and irregular (though perhaps under-recorded) in Wales. They may also be found in small numbers in the southern counties of Ireland, with County Cork generally most productive of sightings. In Scotland records are few and far between, although the coming weeks are arguably the best for finding what is still a rarity north of the border — as with anywhere else, any concentrations of gulls in fields, harbours, estuaries and reservoirs should be checked. Given their advanced moult cycle, the window for observing and studying fresh juvenile Yellow-legged Gulls in Britain is quite small, and the next few weeks are prime time for doing just that. Gull-watching may not seem like the most fitting mid-summer pastime (particularly given the rather 'fruity' smell of many landfill sites during the warmer months! ), but it can be a genuinely productive and rewarding experience, and is a far cry from shivering while watching a developing roost in the fading light of a December afternoon. So, if you find yourself with some spare time in the coming days and weeks, why not head for your local gull hot-spot and see if you can find a michahellis or two?